Windows application software(for machines), by adding the requisite MSI packages. Windows Business Store apps, by using Azure domain account to intgerate Windows Business Store with MDM. You can distribute and install software on Laptops, Desktops and Surface Pro tablets by adding the MSI package to MDM. You need to add the MSI package to MDM server and provide the relevant details. The added MSI package initiates software installation on the machines, after distribution. This is supported only for Windows 10. On the MDM server, navigate to Device Mgmt and select App Repository. Click on Add App and select MSI Software. For MSI source, provide the software MSI package file on which the requisite details gets automatically pre-filled. If you're using MDM On-Premises, go directly to Step #4. Usage - PowerShell -ExecutionPolicy Bypass -NoLogo -noninteractive <path_to_the_downloaded_powershell_script> -Path <path_to_the_MSI_file> -Properties "ProductCode,ProductVersion,ProductName"
Once the above command is run, you'll get a JSON file containing all the requisite details, which is then to be specified in MDM. You can also use third-party software Orca MSI editor to achieve the same. You can also optionally specify Command Line Args, which specifies the additional setup for the MSI installation. Assuming the package is to be installed as an Administrator, you can provide the Command Line Arg /a. To know more regarding Command Line Args, refer to this. After providing the other required details, click on Save. Now, this software has been added to the App Repository and is ready to be distributed to machines and it can be installed silently as explained here. MDM lets you distribute free Store apps, to Windows 10 mobile devices, laptops, desktops and Surface Pro tablets. You need to integrate the Windows Business Store with MDM, by adding your Azure domain account after which all the apps purchased using the particular account gets added to the MDM App Repository automatically. On the MDM server, navigate to click on Device Mgmt and select App Repository, from the left pane. Now, click on the Windows Apps tab. Click on the Login Now button, on which you will be redirected to the Microsoft Azure Website. Login with your Azure domain admin account details. Click on Accept, to provide MDM with requisite permissions needed for Business Store integration. On clicking, you will be redirected back to the MDM server to activate the ME MDM app, which is done to authorize MDM managing your Business Store. To authorize ME MDM app, go to Microsoft Business Store and login, if need be. If you don't have an account with Business Store, you can create on free of cost. Navigate to the Management tools section and click on Add management tool. Search for ManageEngine MDM and select it and click on Add, to add it to the list of management tools. Now, click on the Activate option present under Action, against ME MDM. Once done, go back to the MDM server and click on Finish Integration. Now, all apps previously purchased in Business Store get automatically synced with MDM. Any future purchases will get automatically added during the daily scheduled sync or can be added immediately by using the Sync Now option. The synced apps get added to the App Repository, ready for distribution to groups and devices which can also be silently installed as explained here. Integrate MDM with Windows Business Store, search for the ManageEngine MDM app and click Get the app. In addition to Store apps, a lot of organization use enterprise apps, customized to suit their needs. These apps cannot be usually downloaded from the Business Store, thus making it difficult for the employees to download and/or update these apps. MDM eases this process by letting IT administrators install and update the enterprise apps silently on the devices. You can distribute enterprise apps, by adding App Enrollment Token(AET) or Code Signing Certificate(CSC). App Enrollment Token is created for an enterprise. It provisions a certificate on the managed device, establishing a connection which facilitates Windows app management as the apps share a certificate with the AET. Microsoft Developer Account: You can create one here. Ensure you create a company account and not an individual developer account. Symantec mobile code signing certificate: You can create one using your corporate e-mail and Microsoft developer account as explained here. Download Windows Phone SDK 8.0 from here. Navigate to the folder where it has been installed and open Command Prompt. Now type the following command on the command line. Ensure you have replaced the placeholder variables with the corresponding values. This generates three files, out of which AET.aetx is to be uploaded on the MDM server to manage Windows apps. AET is valid only for an year after which it needs to be renewed using the same company account and uploaded back on MDM server. .
Click on Windows App Settings and select Upload AET. Upload the generated AET and provide an e-mail, on which you'll be notified of AET expiry. All apps must be signed using the AET, before uploading it to the App Repository. The process of renewing AET is similar to generating AET. Before renewing, ensure you are using the same Company ID used to generate AET uploaded on MDM server. In case you use a different Company ID for obtaining the Symantec mobile code signing certificate, you need to use the new AET to re-sign all the apps, previously added to the App Repository and signed using the old AET. Only after re-signing can the apps be distributed to the managed devices. This however doesn't affect the previous installations of the app, where the app was signed with the old AET. In case you need to distribute apps only to Windows 10 devices, you can use third party CA-signed certificates or self-signed certificates to sign the app. In case you're using CA-signed certificates to sign the app, ensure you upload the CA root certificate on the MDM server. 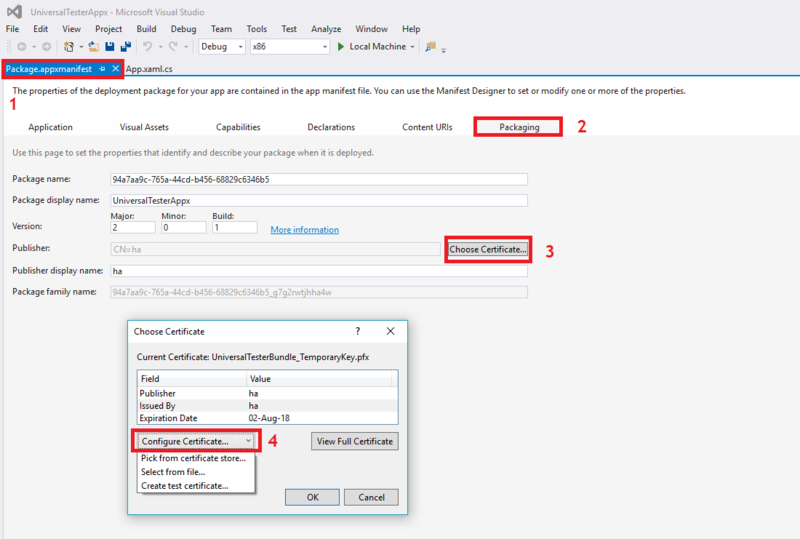 Self-signed certificates are auto-generated when building a Windows enterprise, using Visual Studio. You can navigate to the output location to obtain the certificate and upload it on MDM server. 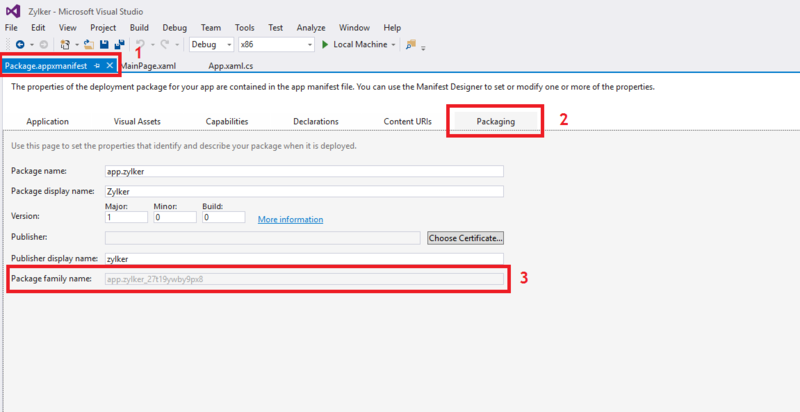 In Visual Studio, go to the package.appmanifest tab and select Packaging. Click on Choose Certificate button present against Publisher and select Configure Certificate. Choose the appropriate option from the dropdown i.e., Select from file, in case you already have a third party CA-signed certificate or Create test certificate, in case you want you generate a self-signed certificate. Add the signed Windows enterprise app as explained here. In case you are uploading .appx or .appxbundle file, provide the Package Family Name as explained here. Distribute it to devices and/or groups. Ensure you select Force install enterprise apps for Distribution Options, which lets the apps get installed silently on devices. App Configurations lets you customize the apps to suit the needs of the organization. You can also secure devices by restricting apps from accessing data and/or resources of the managed devices. The app developer provides a set of key and their value, that specifies the configurations, which have to be entered on the MDM server. These configurations are pushed automatically with the apps.The app developer must support app configurations for the app, to implement it using MDM. Pushing app configurations based on user-specific/device-specific parameters such as E-mail, UDID etc., to different users can be a cumbersome task as the app configuration needs to be modified every time before it is pushed. However, MDM supports dynamic variables which ensures once the app configurations with user-specific/device-specific parameters are setup using dynamic varaiables, they needn't be configured again as the dynamic variables fetches all the required data from device/enrollment details. NOTE: The above mentioned configurations when pushed to the devices will fall under the app's container titled Managed.App.Settings.